Louis Vuitton recently released this beautiful print "evoking the golden age of Transatlantic cruises" and I'm not quite sure what the whole collection is called, but let's go with the Transatlantic Cruise Collection! Today, I'll be reviewing this Mini Pochette Accessoires in the iconic Monogram canvas with the Transatlantic Cruise print. 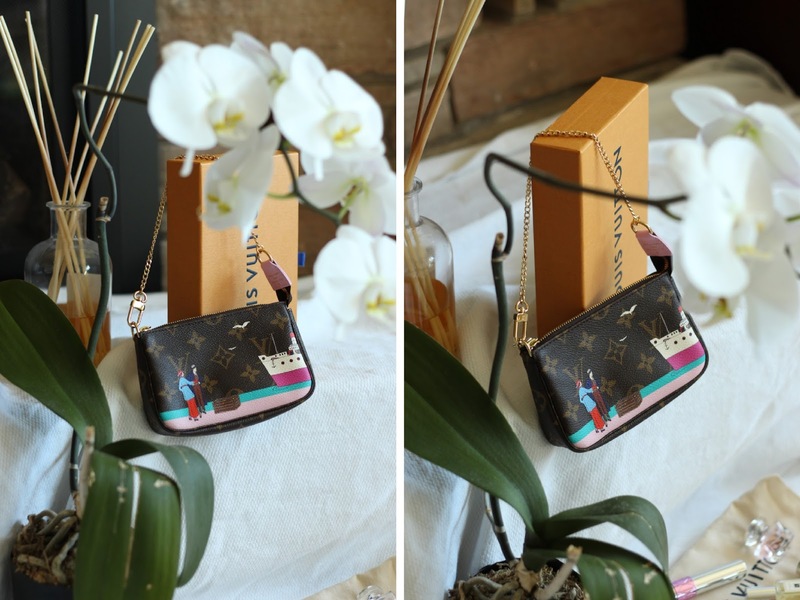 The mini pochette with the Transatlantic print is definitely more of a collector's item but it has great uses to it. Used alone, it makes for a great going-out piece where you only need your necessities: credit cards, I.D., some cash, keys, and a couple lip products. Unfortunately, it won't quite fit the latest smartphones (Galaxy S7, iPhone 6 and higher), but I'm not too worried about that since my phone is usually in my pocket or in my hands! You can also use it as an addition to a larger purse or bag that you already have and use it to quickly locate your essentials. When I see the print itself, I just think of the word "darling" and for some reason, it reminds me of the early 1900s era by the waterfront in England (not that I've ever been to England or did any time travel). The color palette is fun and bright with a contrast of pink and blue hues. My favorite details would have to be the ship and the little anchor in front along with the seagulls in the distance. Overall, I think this piece is great to add to your collection if you can get your hands on it still; it is likely sold out but you can find people selling it on ebay and Poshmark. It's a fun piece but not a necessity, but I feel that you could get a ton of use out of it. If the print doesn't quite suit you, the original mini pochette would still be a nice addition to have! Check out below for a quick unboxing video.